We gave one last round of high fives before the Canadian Team split up and scattered alongside the sea of chompy anxious runners awaiting the gun at the Winschoten road race. 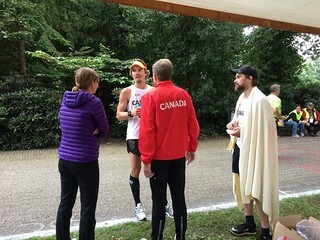 Today the Netherlands, Belgian, European, and 100km World Championships were all at stake. The crowd’s enthusiasm was palpable and the energy was electric as 500 scrawny long distance runners tried to avoid shivering in the cool damp morning. I had an unusual amount of anxiety this morning as I toed the line. Secretly… I was wishing for a new set of legs. I wasn’t feeling top notch, but tried to remind myself that anything can happen in these long races and that I just MIGHT surprise myself. Unfortunately, my day never did improve and the Winschoten 100km turned into my most taxing days at the races to date, but… hey! That’s just the way it goes sometimes. So… what in the world happened in Winschoten?! Well… the gun went off, I crossed my fingers hoped for magic, then ran. This course was broken into 10 10km loops and for the first three loops Gary Poliquin and I chatted and passed the time (a definite highlight). Loop 4 and 5 were OK, but I was feeling crumby, and by loop 6 I was pooped and spent more time in the portaloo then I’d like to admit. From this point onward I struggled with motivation and real tiredness. I was struggling with some cramping. I felt extremely fatigued, hungry, deflated, and discouraged with how difficult these 10km loops were becoming. I earnestly tried convincing our crew and team that I should stop, but they’d have none of it. I wasn’t physically injured, they wouldn’t let me sit down. I begrudgingly marched on… for another 40km, until I covered the entire 100km in just under 10 hours. Putting that into perspective, the top male was 6hrs and 22 minutes and the top women was 7hrs 8 minutes. Looking back, my performance was largely my own fault… well… with a couple factors out of my control. Here’s what I think happened. Recovery; I wasn’t rested. I raced a 50miler four weeks prior. In a perfect scenario I could have recovered, but I failed to factor in: jet lag, hot weather, extremely poor air quality in Calgary, traveling, and the additional stress of being out of my element / routine for too long. Mental fortitude; I underestimated the mental focus required to run a multi hour event. Even while running an incredibly stimulating race with beautiful terrain, grinding climbs, tear jerking views, and ankle twisting single track. I still find the task of running gets tedious as I pass through the six hour mark. Running 10km loops on an exposed paved course required an entirely new level of mental fortitude that I did not possess the day of the race. There’s a good chance that I burned through my mental strength in that same 50mile race four weeks prior. Bottom line, I wasn’t rested physically or mentally. Tapering; I was stale toeing the line. My preferred two and a half week taper was extended to four weeks due to terrible air quality in Calgary – Washington had a huge forest fire and we were blanketed with toxins for almost two weeks. My lungs are sensitive. I shut down my workouts to avoid getting sick when I should have been peaking. I tried making the best of the conditions, but didn’t feel right with the long taper. I could have used more skin in the game; all major expenses for this event were the responsibility of the athlete. Don’t get me wrong, I understand that securing any funding for these events requires a great deal of time and effort (I’m very grateful), but a higher level of commitment from a country or sponsor comes with a higher level of accountability from the athletes. Not trained for the terrain; summer is about four months long and extremely precious in Alberta. I took any chance to run the trails / hills / mountains when I could have been logging hard paved miles. I underestimated the need for course specific running and the confidence that flat hard paved miles can instil. Add it all up, throw in a long day on the roads, and things did go pear shaped, but that’s OK. Hindsight is always 20/20 – definitely one of the downsides to self coaching. I know I’ve gained some new experiences here. Being part of the Canadian 100km Team is an experience I’ll always remember and my team mates and our crew were fantastic. 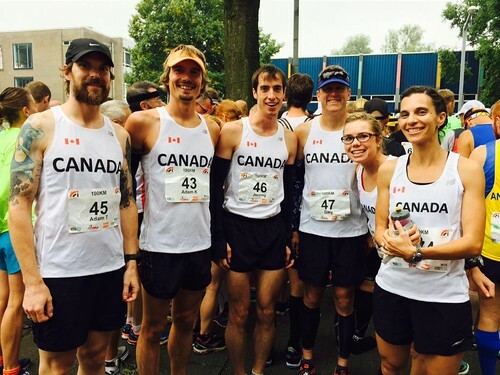 It was an honour to wear the Canadian jersey, and the race… well… the Winschoten 100km will live on as my most taxing event to date, but this new running low might give me a whole new comfort range to work with. Next time I’m going through a lousy patch at an event I can remind myself that it’s probably not quite as bad as Winschoten.